Spring Break is exactly one month away which means it’s almost time to say goodbye to Searcy, grab your friends, get in the car and take a roadtrip. 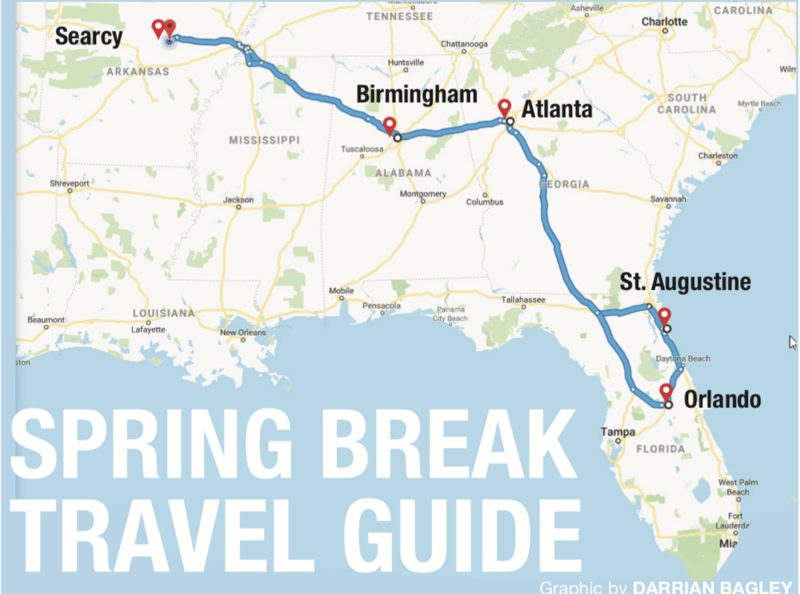 If you aren’t one to plan ahead and haven’t started thinking about your Spring Break plans yet, this is for you. A lot of people think Spring Break is just another trap for college students to spend money, but it’s easy to travel on a budget as long as you’re OK with staying in AirBnBs, packing your own lunch and begging your friends to let you stay at their houses. 1. Birmingham Civil Rights District: visiting a place with as rich of a history as Birmingham, it’s vital to learn about the role the city played in the Civil Rights Movement. 2. Birmingham’s Botanical Gardens: This is notably the most-visited free attraction in Birmingham and it has a picnic area, so pack your lunch and save some more cash. 3. Rainbow Tunnel: The perfect photo opportunity to spice up your Instagram feed. The tunnel is short, but it’s a four-minute drive to the famous Birmingham mural, so you can hit two free tourist attractions with one stone. 4. Sloss Furnace: Once the home to the biggest manufacturer of pig iron, this is a photography hot spot and standing monument to the Industrial Revolution just waiting for you to tour it. 1. Go to the beach. St. Augustine is home to four white sand beaches, all of which costs around $10 for an all-day parking pass. Grab your sunscreen and pack a picnic to keep you relatively cost-free. 2. 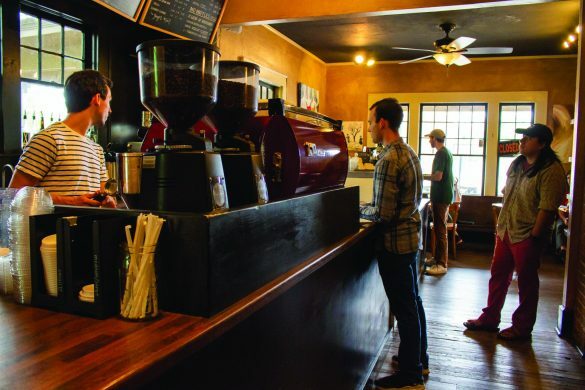 St. Augustine is home to many exhibits and museums that share history from the days that the Spanish explorers arrived and colonized the town. Most museums have entry fees from $10 to $15, but it would be worth it to learn about the history behind the beach town. 1. Disney Springs: As a Disney fan, I can’t tell you to skip Disney. But tickets are expensive, so if you’re looking for the amusement-park experience without emptying your wallet Disney Springs is a free outdoor shopping, dining and entertainment center. You’ll get the trademark Disney magic for a fraction of the price. If you are looking to splurge, Disney World tickets are $110 for the week of Spring Break. 2. Universal CityWalk: In the same vein, Universal Studios has the Universal CityWalk, which is another shopping, dining entertainment epicenter but this time with free self-parking after 6 p.m. If the CityWalk won’t cut it, and you’re willing to risk it all to experience The Wizarding World of Harry Potter tickets will cost you $114 a day. 3. Blue Springs State Park: If the city isn’t your thing, head 45 minutes north to Blue Springs State Park, which is known for being the winter gathering site for Florida manatees. There’s a $6 parking fee and if you want to canoe among the manatees, you can rent a canoe for $14. 1. The Original Chick-Fil-A: Don’t say you like Chick-Fil-A if you aren’t willing to drive to Hapeville, GA to take a picture with the tiny door. The original Chick-Fil-A was built in 1946 as a diner rather than a fast food restaurant in an Atlanta suburb. The real Chick-Fil-A fans know what to get: the original chicken sandwich and waffle fries. 2. Centennial Olympic Park: See the Fountain of Rings and its many interactive fountain shows. The fountain show plays four times a day, and in the meantime, you can explore the park with the free audio tour. 3. The Varsity: Eat lunch at the World’s Largest Drive-In restaurant that has been family owned and operated since 1928. This is an Atlanta staple but make sure to look on their website beforehand to get down all the right lingo. 4. The World of Coca-Cola: It’s not free, but spend $16 and tour the interactive Coca-Cola Factory. Once you’re there you can find out the secret behind their secret formula, all about the bottling process and even take a picture with the Coca-Cola Polar Bear.